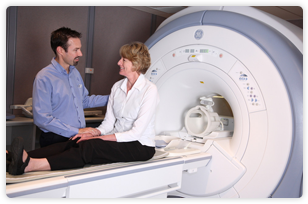 Magnetic Resonance Imaging (MRI) is a safe, painless and powerful diagnostic imaging test. MRI technology is very complex but essentially uses a strong magnetic field and radio waves to produce exquisite images of breast tissue. Unlike mammography, MRI does not use radiation. Breast MRI scans are typically completed within 30 to 40 minutes. An MRI scan involves no x-rays, as it uses magnetic fields and radio-frequency waves to produce an image that gives great detail of the breast tissue and surrounding structures. Generally, an intravenous injection of MRI contrast material (gadolinium) is required. 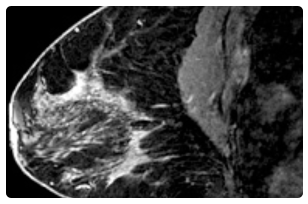 MRI allows significant freedom for the Radiologist in choosing what plane of orientation to view the breasts, while x-ray mammography requires re-orientation of the breast for the two standard views acquired. The main strength of MRI is its ability to detect breast cancer even within the middle of the very dense breast tissue or in the presence of breast implants. This is because most breast cancers have abnormal blood vessels within them, which means the contrast injected in your vein collects at the cancer site, making it visible on the MRI image. Although breast MRI is the most sensitive test available to detect breast cancer, not all cancers can be detected by MRI. What is the evidence for breast MRI? Perth Radiological Clinic has been involved in local studies showing that breast MRI is an effective tool in detecting breast cancer in women at high risk. Large international studies show that MRI and mammography are equally important and each plays its own role in screening for the presence of breast cancer in women at increased risk. A breast MRI uses expensive equipment and contrast. It takes time and requires staff with specialty expertise to perform the scan and to interpret it and issue a report to your doctor. Because of these reasons it is an expensive examination. A Medicare rebate is available for screening women at high risk. During the MRI scan usually an injection of intravenous contrast is required. A small needle will be put into a vein in your arm for the administration of contrast medium called gadolinium. The scans are taken with you lying prone (on your stomach) so that your breasts are positioned with in a coil (a special piece of equipment) which collects signals to construct an image. Your breasts are gently compressed into position. After the preliminary scans are taken, the contrast is injected and the scans taken immediately. If you are being scanned because there is a concern that your implants are ruptured you will not need the injection of the contrast medium as ruptures are easily visualised. The scan may need to be booked at a particular time in your menstrual cycle. This will be discussed when your appointment is made. The time in the MRI room is approximately 30 to 40 minutes. After the examination you should be able to resume your normal activities. If you know that you have a history of allergies – please inform the technician before the examination. Always bring with you any previous breast mammograms or ultrasound images. If you have any questions please do not hesitate to ask us!